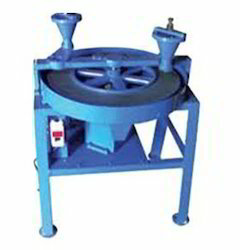 Dorry Abrasion Testing Machine comprises of a flat circular grinding lap, rotating in a horizontal plane at 28-30 RPM. The grinding lap is driven by a motor with the help of reduction gears. Two conical hoppers with stoppers are mounted above the grinding lap on opposite sides, for the controlled flow of sand. We are a known Dorry Abrasion Testing Machine Manufacturer and Supplier in India.